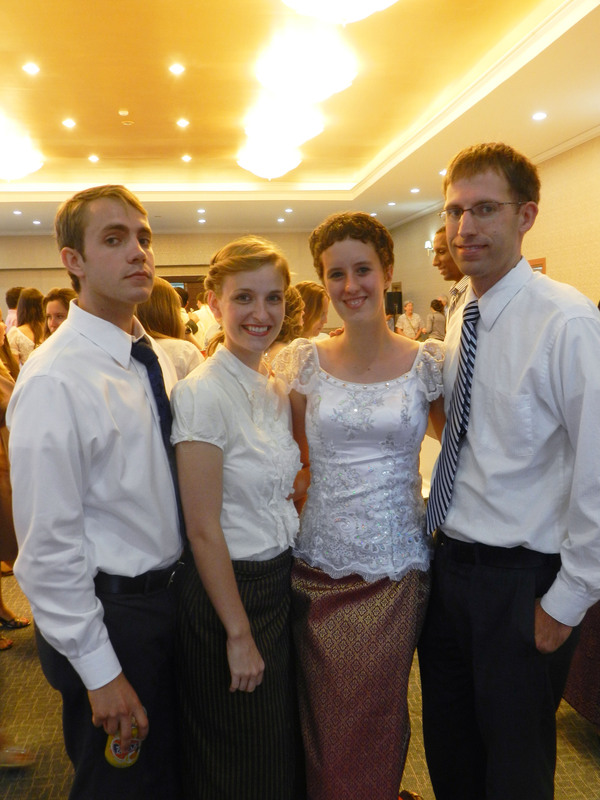 I thought it was only fitting today (our two year wedding anniversary) to write about how it has been to serve in the Peace Corps as a couple so far. One of the clearest memories I have from staging in San Francisco is the swarms of people gushing about how lucky I was to be serving with my husband. “That’s so great. It will be so much easier for you two,” they said. At the time, I resented this a little. Having lived abroad before (with Tim and alone), I felt like they were missing a big part of the story. Yes, in some ways it will be easier, I thought, but in many ways it will be much more difficult. However, more than two months in, it looks like they were more right than I was. Serving together has been extremely easy so far. In many countries where the Peace Corps serves, couples are split up for training. This means that couples spend their first two or three months in country—the most difficult months for many— apart from one another. 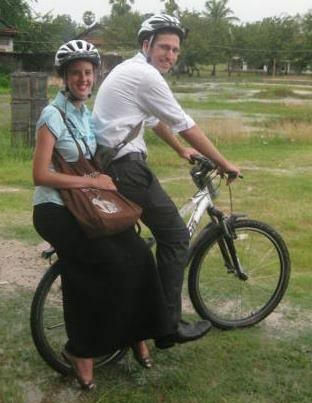 In Cambodia, however, Tim and I got to live and study together during training. Although I imagine that being separated would have helped us feel more independent and to get to know more of our fellow volunteers, being together in Takeo worked well for us. We were able to come to permanent site with a similar foundation that made us feel unified in our knowledge, goals and expectations. It was also great to have a built-in study partner during training, and it was incredibly useful to have two people trying to decipher Khmer instead of going it alone. I think the biggest advantage though has been the comfort and ease with which we have been able to face transitions. Initially moving to Cambodia, visiting our new site, and then eventually moving in were all much easier for me with my partner at my side. I don’t think either of us felt the isolation or panic that some volunteers felt when being faced with these completely new situations. While I think our personalities certainly play a role in the smooth transition, being with my best friend was a critical part of it too. The biggest difference in our relationship since we’ve arrived in Cambodia has been the amount of time we spend together. We both have histories of being workaholics in the States, which limited the time we were together each day, but right now we are spending around 20-22 hours a day together. It’s been so much fun to share and process all of these new experiences with one another. We’ve had plenty of time to discuss Cambodian politics, play cribbage, ride our bikes through the countryside, sip on coffees, invent catchy songs about the heat, conduct impromptu puppet shows, and then get bored of each other. And during those times, we just do the housework, catch up on our reading or write more blog entries. We've gotten so close we even ride the same bike! The one challenge I think that couples face that is unique to them is that it can be easy to take out any negative feelings on your partner—and this holds true, not only in Peace Corps, but in all stages of life. All volunteers feel frustrated, exhausted, confused or overwhelmed. And all volunteers will feel these feelings on a very regular basis, even if they are only fleeting feelings that dissolve quickly. Presumably, if you are a single volunteer you will take a nap, go on a run, have a good cry or call your family and the feelings will pass, no harm done. However, as a couple—and particularly a couple that is together as often as we have been here—it can be easy to take these feelings out on your partner without realizing it. And, depending on the day and the mood of your partner, this can easily escalate from a momentary feeling of frustration to an all-out argument or, even worse in my opinion, a silent wall of tension. Luckily, I am married to a man who is able to keep perspective and maintain a positive attitude so this does not happen too often, but the heat, bugs, language struggles and cultural differences can wear on anybody so it happens—even to us!—from time to time. Serving with Tim has been a blast up until now, and I can’t wait to see where we are at the end of our time here. We will undoubtedly face a lot of challenges here as we develop, learn and integrate at different speeds and in different ways; however, I feel privileged that I get to celebrate two sets of victories, learn about two different sectors and gain insight from two people’s separate experiences. Thanks for your kind words, Brenda! And thanks for keeping up with us. We’d love to hear how you’ve been. Shoot us an email when you get time! It’s blog posts like these (or rather the thought process behind them) that make you two the power couple of Cambodia :D It brings me great joy to envision the two of you up in Siem Reap playing cribbage. Also, them’s some mighty fine pictures! Hello! I know that you wrote this post long ago, but I thought that I would comment anyway, or at least thank you. My husband and I are about to leave for Peace Corps Morocco on Monday, and since this is so soon, the nerves have hit me hard. I randomly decided to google something along the lines of ‘the difficulties of serving as a couple’ and stumbled upon your blog. You have reminded me that I am serving with my best friend, and that many of my fears need not worry me so. In my past experiences of life-changing adventures, I usually went alone and isolation was troublesome, to say the least. I have to keep telling myself that I won’t have that issue of loneliness. Of course, there will be challenges like you mentioned, however, given our love of laughter, I think the support of each other will be immense, and I feel very lucky. Sorry for the rambling comment. I really just wanted to thank you, as your post has calmed my nerves a great deal.